I was born and raised in the great, potato-growing state of Idaho. Potatoes are a big deal here. Really big. I remember that in 4th grade we had to compose a song about potatoes. Yes, you read right, and yes, I still remember the words and tune almost 20 years later (we even had to create a dance, which I have conveniently blocked out of my mind). Julienned, french-fried, mashed, and hashed. But Idaho potatoes we love to munch! I’ve never been to Maine or had potatoes from there to my knowledge, so I have no idea where the third line came from. The thing is, I’m not the biggest fan of baked potatoes. I may have to turn in my Idaho card for saying that, but I’m going to say it. 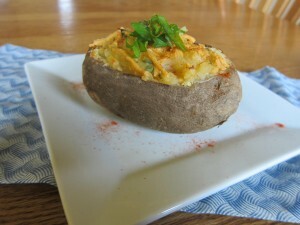 Something that I remember having while growing up, and actually enjoying, however, was Twice-baked potatoes. I suppose the reason why I liked them was because they were more of a mashed potato, and they were also loaded with the good stuff like sour cream, butter, bacon, and lots of cheese. 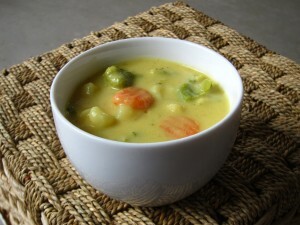 When my family started eating more healthy and dairy-free, however, the recipe needed an overhaul. To replace the sour cream, I found the perfect substitute in So Delicious Cultured Coconut (or yogurt). It provides the necessary tang and creaminess. Smoked paprika is used to replace the smokiness of the bacon, and dairy-free cheese is used in place of cheddar cheese. The result is delicious, without feeling the least bit deprived. Preheat oven to 350 degrees and bake potatoes for one hour (don't forget to pierce them with a fork). In a medium bowl, whisk together the remaining ingredients until combined. 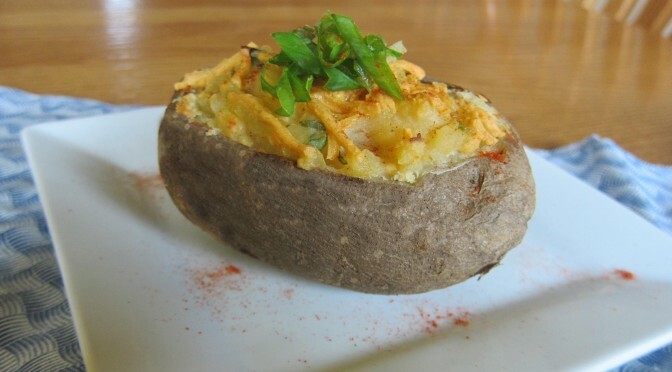 Slice the baked potatoes in half, lengthwise, and scoop out the flesh into the yogurt mixture; reserve the skins. Using a hand mixer or just a potato masher, blend (or mash) the potato/yogurt mixture until it's the consistency that you like your mashed potatoes (I like mine with some texture still to them, others like it smooth and creamy; either way is delicious). Portion into reserved potato skins and sprinkle with extra cheese. Move oven rack to the upper-middle position. Bake for 15 more minutes, or until cheese is melted. You can also put them under the broiler for an additional 3-5 minutes to get the cheese brown, and crispy. Serve with an extra sprinkle of sliced scallions and a dash of paprika if desired. 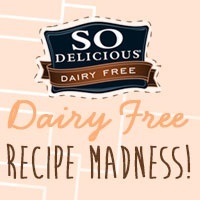 I decided to also enter this recipe in So Delicious and Go Dairy Free March Recipe Madness Contest. I again barely made it under 8 ingredients with this one. When I first began cooking gluten-free, I was sorely disappointed with the pancake recipes out there. Pancakes were always so nice for a quick dinner, but the gluten-free recipes I tried were either bland, gummy, or both. The gumminess was the most disheartening; no matter how long I cooked them, it was as if they never cooked through. That is where this recipe comes in. 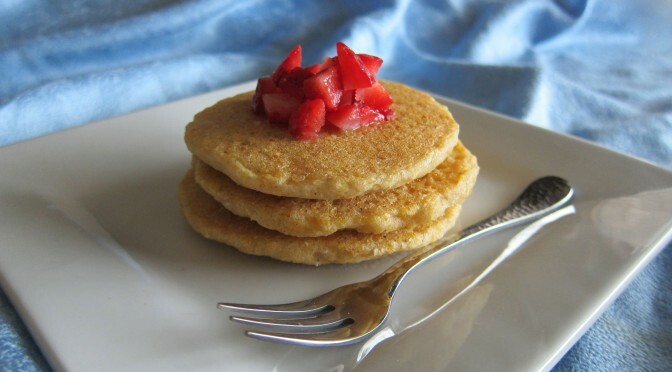 Cornmeal pancakes, or Johnny cakes, offer a great alternative because of the smaller amount of flour. 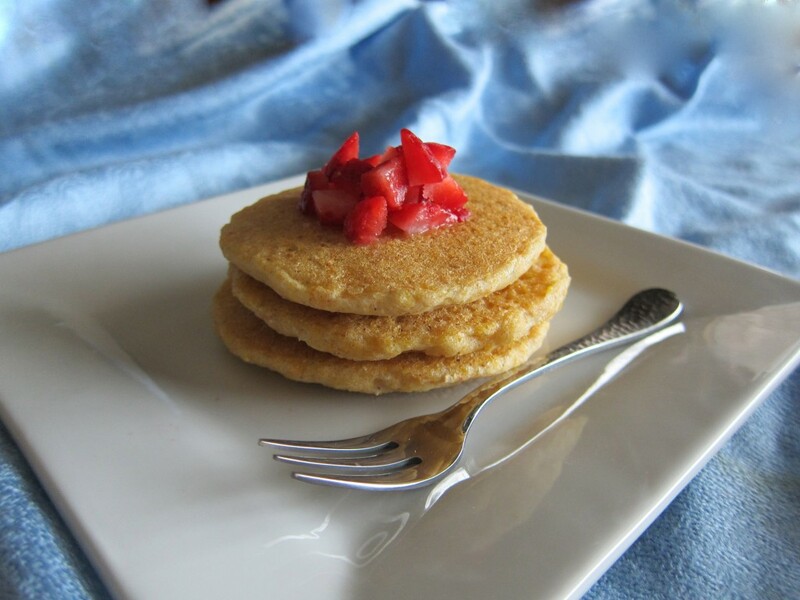 The result: flavorful and gummi-less pancakes at last! In fact, I would say these are downright fluffy. Preheat oven to 200 degrees. Place cooling rack on baking sheet and place in oven (to keep pancakes warm). Whisk coconut milk and lemon juice together. 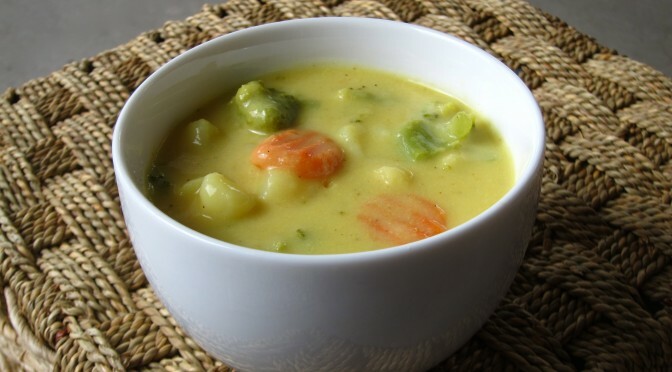 In a large microwave-safe bowl, mix 1-1/4 cup of the lemon juice/coconut mixture, cornmeal, and coconut oil. Cover and microwave for 90 seconds. Set aside for 5 minutes, keeping it covered. Get griddle preheating on medium-low heat. In a small bowl, whisk together sorghum flour, potato starch, xanthum gum, sugar, baking powder, baking soda, and salt. Whisk remaining lemon juice/coconut mixture into cornmeal mixture. Mix in dry ingredients. Set aside for 3 minutes. Spray griddle with non-stick spray or lightly brush with oil. Place 1/4-cup amounts of batter on griddle. Cook for 1-2 minutes per side, until lightly golden brown. Serve. My favorite way is with strawberries and honey. Microwaving the cornmeal softens the grains quite a bit. Combining lemon juice with So Delicious Coconut milk provides the necessary acid to react with the baking soda to provide lift. This is a new favorite recipe for me because I have all of these ingredients on hand all the time. It’s one that can be done quickly too. 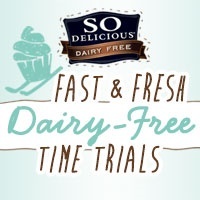 So quickly that I am entering it in the So Delicious Fast and Fresh Dairy-Free Time Trials Contest in the 15-minute category.